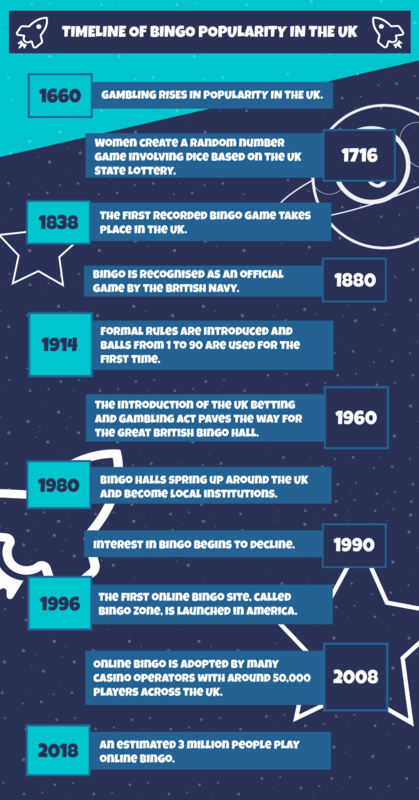 Bingo Fever in the UK – Where did it Start? The British love of bingo is known around the world, as the stereotypical game is recognised all over. We know that the UK loves bingo, but where did this all begin? Join us as we take a look at the timeline of this game and how it intersects with our history. In the 1600s, gambling really took off in the UK. From gaming parlours to racing, the public loved to take a punt on a variety of different bets. At this time, there weren't many rules or regulations governing this gambling activity, meaning it was rife with crime. This meant that gambling had something of a bad name. Women very rarely gambled at this time as a result. Shifts in the monarchy at this time outlawed gambling for a number of years, as puritanical rule put an end to this vice. After this rule was over, the laws became more relaxed and a state run gambling game, which resembles the bingo that we know today, was introduced. Through the navy, Mexican and Maltese games were brought back to the shores of the UK. These helped to form the game further and create more standardised rules. Game cards and markers would become more widely used at this time too. This is when bingo really starts to become the game that we know and love. Now that bingo has been established, it's ready to really catch on in the UK. Different factors combined together to make this so popular. The First World War put an end to a lot of innovations around the game, but it couldn't keep a good game down for long. Even soldiers enjoyed the game in their down time and when the war was over, the public were crying out for bingo. In the 60's, the government brought in the Gambling Act, which made this a legal and commercial enterprise. What was once a small scale operation could begin to grow and brought bingo halls to our shores. It was clear in no time that this would be a viable way for chains to make money, leading entrepreneurs to get involved. At this same time, cinemas were in decline. This left a lot of buildings open for use, with prospective bingo hall owners ready to snap them up. With speedy refurbishment, these became the place for social gatherings. Bingo halls continued to peak until the 90's, when growth started to slow down. Less people were interested in playing the live version of the game and halls began to close. With fewer halls open, less people ventured out further to get to their local bingo hall. When the Smoking Act came in, this also had a knock on effect to these players, as they didn't want the hassle of leaving the hall to smoke. Today, the online bingo industry has overtaken the live bingo halls that were once so popular. With thousands of different brands online, it's clear to see that we still love bingo. Innovation is thriving online, with new variations of bingo games injecting more action into the game. New jackpots and bonuses are also keeping things exciting for players. Into the future, bingo will most likely remain popular online. Some bingo halls are being refurbished and revived, but online bingo offers convenience and more choice. As technology becomes even better, we can't wait to see how this will impact our favourite game.